Rumour [unsubstantiated] has it that this set of eleven striking lights was salvaged from a Manchester nightclub. They are unique and would make a real impact in any large store, restaurant or club setting. 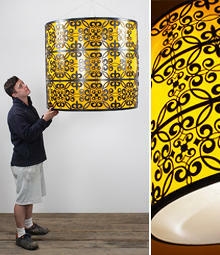 The vivid orange-yellow Perspex pendant shades are surrounded by elaborate black metal fretwork. At the base they have a frosted Perspex baffle to soften the light. 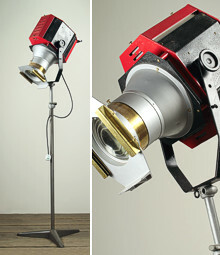 The lights are an interior designer’s dream – vintage, rare and flamboyant without being ostentatious. 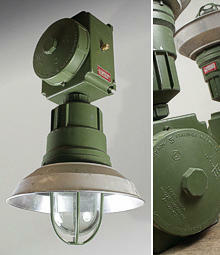 Each light has three bayonet bulb fittings and four small drilled holes to the top of the metal frame for hanging. There are a few areas of loss to the metalwork but the lights are in good condition and very striking. The light fittings are untested. NB: These are very large - check the dimensions. Would you make a statement using these in your design? 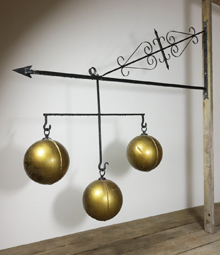 Reclaimed pawnbroker’s wall-mounted shop sign in the traditional form of three gold balls suspended from a gold bar. There are several theories as to the origins of the pawnbroker’s sign, amongst which one that the bezants originated from the Medici family crest, which consisted of six of these balls, representing coins or the weights used when money-lending. The Medici were the most influential banking family in C15th Europe. Another theory of the origins of the sign is that pawnbrokers in Lombardy used to hang three gold coins outside their shop to attract attention, then moved onto three gold spheres as they were more noticeable. The third popular theory is that the C4th Saint Nicholas of Myrna gave a poor man's three daughters each a bag of gold as a dowry without which they would not be able to marry and would likely have had no other choice but to become prostitutes. By coincidence, or perhaps not, December 6th is not only International St. Nicholas Day, but also National Pawnbrokers Day. An imposing statuary marble surround with a fascinating history. This fireplace was reclaimed from Chatsworth House Estate and was likely to have been designed by Sir Jeffry Wyatville in the 19th Century. Sir Jeffry Wyatville, a painter, draftsman and architect, was commissioned for the alterations at Chatsworth from 1818 by the 6th Duke of Devonshire. This white marble chimneypiece, with its scrolled volute brackets ending in stylised anthemion, is identical to that installed in the Flower Room at Chatsworth. The "stepped" frieze and boldly scrolled volutes with anthemion relate to other non-grec motifs seen in Wyatville's work at both Chatsworth and elsewhere. We reclaim thousands of doors; from the usual Victorian four panel pine doors, to the very unusual, one of a kind statement doors and this oak double door is definitely one of the latter! 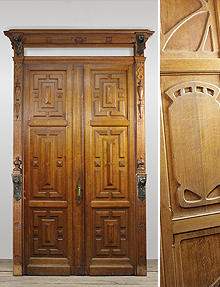 Reclaimed from a grand house in central Lille, France, this antique door has double the impact with one face having an art nouveau style design, and the other a neo renaissance appearance. Both sides of the door come complete with an architrave, as well as dado height room panelling and a swans neck shaped fireplace overmantel. 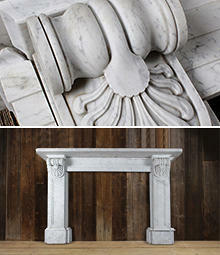 To complete the room interior, we have the original marble and slate fireplace available too! Antique stained glass found in churches has the most amazing, brightly coloured designs and this reclaimed piece is no exception! The window is made up from six leaded panels and has a bright purple border with Gothic shaped tops. 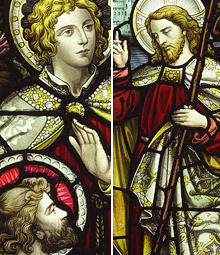 The stained glass window depicts a scene from John Chapter 21 where Jesus asks Peter to care for his sheep and has been fully restored in 1995 with a commemorative plaque to the family who likely funded the restoration. If you’re looking for several large, impactful, statement lights, then look no further! We reclaimed 40+ of these chunky metal Italian military lights and have repurposed one into a pendant light with the idea of using the original mounting block as a matching ceiling rose. These lights could also be used as wall up / down lights... the possibilities are endless! 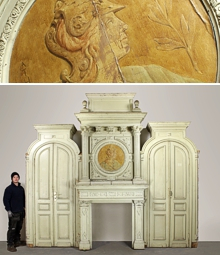 When we photographed and appraised this antique French Neoclassical chimneypiece, overmantel and arched cupboards, Laura (our photographer) found a snippet of a French newspaper with the date 27th August 1893 in the back of the fire surround. The way it was packed into chimneypiece looked as if it could have been put there during construction, possibly for insulation or immurement; the practice of burying or concealing items in the structure of a house. The newspaper title Roubaisien translates as from Roubaix (a city in Northern France). This area of France grew rapidly in the 19th Century thanks to a booming textile trade. We can envision a wealthy textile tycoon commissioning this grand chimneypiece for their beautiful home! These gorgeous hand carved oak stair spindles were originally commissioned for the impressive 16th Century Fawsley Hall, which is located in Northamptonshire and set in 2000 acres of gardens partly landscaped by Capability Brown in the 1760’s. The hall suffered at the hands of the military during WW2 and was left empty following the end of the war. Over the past ten years the hall has been fully restored to its former glory and transformed into a luxury hotel. This is likely when the stair spindles were removed and reclaimed. Originally part of the Wickhams department store, completed in 1927 and designed to be the Harrods of the East End. 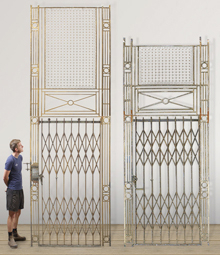 The imposing classical style included these highly detailed, ornate lift doors, frames and balustrades. The story of the store construction is worth a few lines in itself and, as you’ll see, resulted in a rather out of the ordinary win for the little guy! As the grand department store was being built, it was presumed the wealthy Wickham family would finally buy out the small, family run Spiegelhalter jewellery company, whose modest premises were located smack in the middle of the department store’s street frontage. However, having already moved once to accommodate the Wickham's earlier expansion, the family run jewellers would not sell this time, leaving the completed building looking rather….. unique. Click here to see it in all its glory! These highly detailed sandstone corbels feature scroll and foliate designs. The huge amount of care and attention put into carving these corbels by hand makes for a beautiful finish quality. 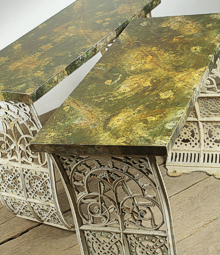 If not re-used as originally designed, and with several available, one idea could be to repurpose them as unique outdoor coffee table or bench legs. Charming views of the English and Welsh countryside created by Phillip James de Loutherbourg (also known as Phillippe-Jacques). Loutherbourg was born in Strasbourg in 1740 and became a well-known painter, set designer and inventor. 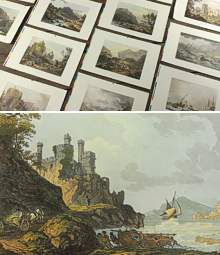 These drawings were originally published under the title ‘Picturesque English Scenery’, around 1801 – 1805, and were reproduced using aquatint; a form of etching. Several of his paintings are now in the government art collection. During the 18th Century, dentistry was in its infancy and only the well-off could afford a trip to the dentist. As the middle class began to grow in the 19th Century, more and more sought assistance from a dentist. 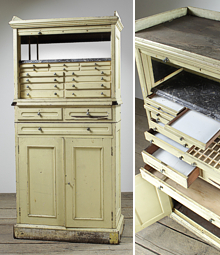 This handmade dentist’s cabinet was made around the turn of the 20th Century and with several small drawers above a large double cabinet below, it could be repurposed as a useful vanity and jewellery cabinet. This original Victorian cast iron water fountain is crying out to be returned to its former glory and located pride of place in a beautiful garden. 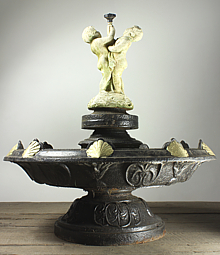 With two cherubs, gold shells, leaf detailing and multiple outlets for water, once restored, this fountain will be the highlight of a garden or driveway. These repurposed balcony sections are great examples of why the designer Christopher Dresser is thought of as one of the most talented designers of the 20th Century. Dresser’s success was in part down to his enthusiasm for the industrial revolution. While contemporaries such as William Morris rallied against modernisation, Dresser appreciated the benefits it could bring and he strove to successfully produce well designed, functional and affordable products for everyday people. 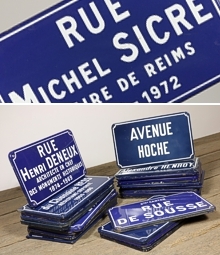 Vintage French enamel road signs all with a blue background, white writing, a white border and look really effective when displayed in multiples. Several of these signs refer to areas of Paris; such as Rue De Lapparent and Avenue Hoche. 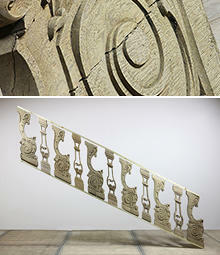 These decorative signs work well in an industrial loft type interior, or exterior. Alternatively they could add a touch of nostalgia to a French cuisine restaurant or café. Strand theatre lights are highly regarded in the theatre community, having been used throughout theatres in the UK and Ireland since the company’s inception in 1914. Strand Electric, as it was originally named, was founded by Phillip Sheridan and Arthur Earnshaw, both theatre electricians based in London. This striking Stand floor lamp is an excellent example of Strand lights and with some restoration would make a fantastic feature floor lamp. This is 'featured items'! - where we showcase just some of the unique, unusual and very special items currently for sale. In addition to the normal listing for these wonderful items - we've added a few thoughts of our own as to why these deserve your special attention. You can add them to your bookmarks or see the full listing for each by following the links. These featured items will be updated regularly - so be sure to check out this section every time you visit.